During the keynote at #SPC18 last week, the MS team re-assured the attendees that SharePoint is seen as a 'foundational service' for Office 365, along with OneDrive and Exchange. Microsoft has seen a 200% growth in SharePoint storage used in O365. Out of all active SharePoint seats – 70% of them are for SharePoint Online (as opposed to on-prem). Their strategy has 4 pillars that are defining the dev work they are doing day in and day out. Here's a summary of those pillars and what features we're seeing happen for each of them. Although there is some overlap between them, each of these pillars tends to appeal to a different part of your platform's audience. I'm encouraging my clients to think about each of these 4 pillars when pondering their governance, adoption, and support plans. Figuring out how Microsoft's development strategy matches up to your own organization's growing needs can really help optimize the ROI, provided you craft your strategy to run parallel to it as much as possible and take advantage of it. The new http://Office.com start page includes a 'recommended' section that is powered by AI and the Office Graph. It aggregates files / folders / sites that should be most relevant to your day, items you've pinned for quick access previously, as well as things others have shared with you across OneDrive and SharePoint. File usage metrics are now added to the file card and the details panel to help you figure out what is currently being worked on by others. List / Library views now update in near real-time as others are working concurrently. Teams tab views from SharePoint are becoming more functional like they are in the browser to encourage active use from the Teams client. News now rolls up and pushes notifications on the SharePoint mobile app and in Teams. New modern web parts, including maps and weather. An out-of-the-box approval workflow that you can enable and then customize using Flow. Content targeting with audiences that compile based on user profile properties in near real-time. Site designs that can be fired automatically fired when a site joins one of the new ‘hub sites’ to provide consistent elements and experience throughout the family of sites grouped around the hub. SharePoint Spaces – the new VR / MR feature that allows immersive experiences to be built without significant dev work based on templates that take care of a lot of the complex bits that stitch things together (theme, background, spatial geometry...). Build something here, and it works either with a HoloLens headset or with a traditional monitor. 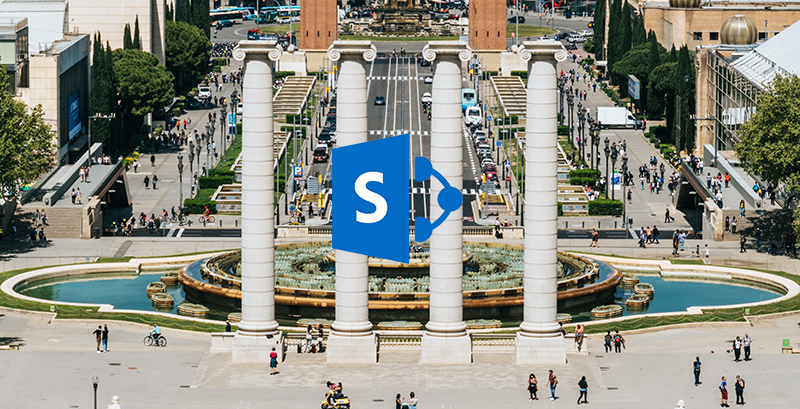 If you want to play with it, apply for the preview at https://aka.ms/SharePoint-Spaces. Soon we’ll see an Office 365 Training site that we can add to our own SharePoint intranet where MS will feed training content directly from their own Azure content repositories. Cognitive services are being tied into several no-code dev surfaces, including SharePoint lists, PowerApps, and Flow. These process text for sentiment, key phrases, translation, or even moderation purposes. They can then be used in a variety of ways – like: formatting rows, inferring meta-data, automatic Power BI insights on list data, and new ways to create lists (especially from existing lists that are tied to PowerApps and Flows already). Some of these new and ‘coming soon’ items are pretty powerful and have a lot of potential to change the way we work and the solutions we build for others. If you're focused on solutions and adoption for SharePoint and Office 365, there was a lot to start playing with and look forward to. Find out if you are checking all of the boxes and getting the most out of SharePoint and Office 365.